Lossy encoding creates unwanted and weird effects. The MP3 codec tries to recreate the full frequency spectrum regardless of the encoding frequency, so at very low values it develops weird artifacts that I always found interesting in a creative way. I've been looking for a VST plugin that encodes and decodes audio in MP3 format but it seems like it doesn't exists. Also normal codecs like LAME or Fraunhofer don't create enough artifacts to satisty my needs except the one that comes with Macromedia/Adobe Flash. Also older version work as far as they can import WAVS. Load up the .WAV into the library and put it into timeline. Edit the properties and start playing a little. Basically very low frequency work well for this. 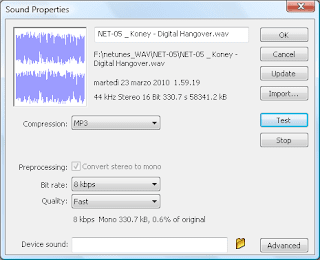 It is possible to load single tracks or entire mixes, but more variegated material will create more fractalization after the encoding. Export the .SWF and use something to convert it back to .WAV. This appears to work well but there are surely alternatives to test out also on other platforms. Put the result together with the original track on your preferred audio sequencer and start mixing them. You really don't need to be an EQ wizard to be able to enhance the artifacts frequencies. This is the .SWF version of my latest song (just as an example). The resulting file is less that 300kb, so it is clear that the codec is "inventing" back most of the audio!